Middle school can be difficult when it means going to a bigger school where your friends from elementary school are in different classes and even lunch waves, and Dany is having a hard time. There are a few kids giving her a hard time on the bus as well, and her old friends seem to be developing other interests. After visiting her recently deceased Aunt Elma's house and bringing the aunt's sketch book back with her, Dany doodles a bit and brings to life the disembodied head of Neptune, a character from a show who is somewhat evil but whom Dany feels is misunderstood. Later, she creates Madison, a girl who comes to life and becomes her new best friend. Dany encourages her to doodle things like flying rings and wallets that have endless cash supplies. The two go to the mall, buy new wardrobes, and have a generally good time. Madison is a bit confused that she can't remember her parents, and stays with Dany's family for a while. Eventually, the two have a misunderstanding, and Dany is right back where she started as far as friends go. Neptune gives her very bad advice, almost costing her a couple of friendships. 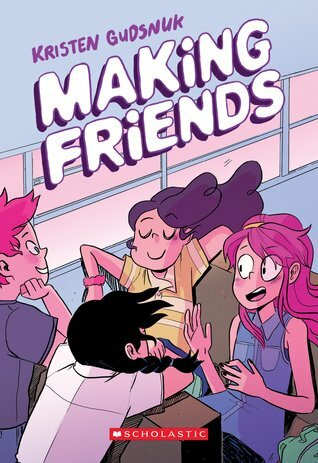 After Neptune shows himself at a school pep rally and things get kind of crazy, Dany manages to bond with other kids who help her handle her imaginary friend. Strengths: Friendships are a huge issue in middle school, especially when circumstances cause changes in relationships. The idea that one could draw a new friend is extremely appealing. I really like that Scholastic is trying to publish more graphic novels aimed at middle grade readers. The text size, topic, and drawings are all very appealing and well done for middle school. Weaknesses: This had some confusing moments and messages. Perhaps I was missing some details in the illustrations in the E ARCs, but it was hard to follow what Neptune's motivations were, and even the relationship with Madison didn't always make sense. I'm not a fan of disembodied or dismembered heads (think of my reaction to Dogman), so maybe that's why the story seemed odd to me. What I really think: I definitely think readers will pick this up, and book fairs will no doubt sell out. I was hoping for something a little more like Jamieson's Roller Girl or Holms' Sunny Side Up, but the fantasy elements will most likely be fine with most readers. I will probably purchase this in a prebind in a year or two when I need to refresh my graphic novel collection.